Prior to the First World War, more people learned of evolutionary theory from the voluminous writings of Charles Darwin’s foremost champion in Germany, Ernst Haeckel (1834–1919), than from any other source, including the writings of Darwin himself. But, with detractors ranging from paleontologist Stephen Jay Gould to modern-day creationists and advocates of intelligent design, Haeckel is better known as a divisive figure than as a pioneering biologist. Robert J. Richards’s intellectual biography rehabilitates Haeckel, providing the most accurate measure of his science and art yet written, as well as a moving account of Haeckel’s eventful life. "[An] excellent, well-illustrated and scholarly biography of Haeckel." "A truly engrossing and fascinating story about a man, the product of 19th century Romanticism, part artist, part scientist, who becomes by his own insight and conviction the epicenter of a powerful clash between science and religion. Even 100 years later, the repercussions of Haeckel’s actions continue to be felt in today’s scientific, popular, religious, and even political discourse. . . . Richards’ exhaustive scholarship is evident throughout this brobdingnagian and revealing work of biography and history of science....this book will go a long way in recalibrating our understanding, even our appreciation, of Haeckel’s position in the history of embryology and of his contributions to modern biological research." 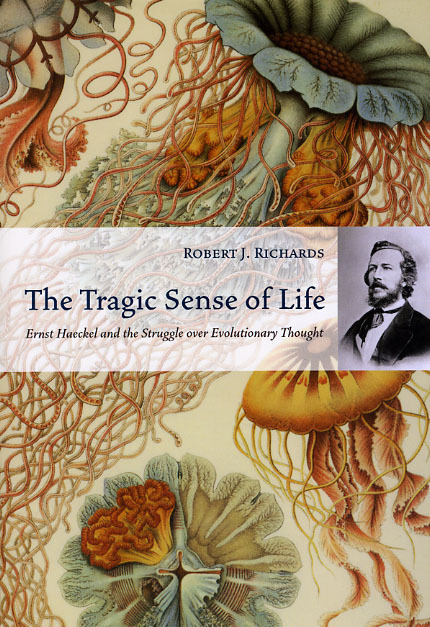 "The Tragic Sense of Life, by Robert J. Richards, provides not only a biography of the controversial German evolutionist Ernst Haeckel (1834–1919), but also an important piece of the emerging picture of the Darwinian Revolution in its international and intergenerational dimensions. . . . Richards’s analysis brings Haeckel and Darwin closer together than ever before, even for those of us who resist making Romantics of them both. By doing so, and by defending Haeckel from the excesses of his critics and bringing out the personal side of his science, this book marks a major rehabilitation of Haeckel as a mainstream Darwinian, and a full-blooded one at that. It writes Germany into the larger story of the international development of Darwinism in a new way, and it injects welcome doses of drama, romance and natural beauty into the story." "In this magnificent book, Richards gives Haeckel a scientific reputation that he never quite secured during his life. The case is compelling that we should go back and look at Haeckel’s scientific work, and not just at the gorgeous pictures that have often distracted historians. Thanks to Richards, we have a guide to the work and its context and impact. He has brilliantly illuminated this fascinating and tragic life." "Haeckel has now found his champion in historian Robert J Richards who sets out to change forever the general perception of this man, whom he regards as one of the greatest in the history of the life sciences. . . . Thanks to Richards’s magnificent biography, Haeckel will never again be discounted." "This is a fascinating book. It should be read carefully and avidly."